Comics (along with many things in life) aren’t as good as they used to be. They’ve changed over the years……well perhaps its ME thats changed. Whatever, it doesn’t matter how much the art/colours/paper improves I’m never going to re-create the experience of that excitement of discovering Insert favourite character here for the first time. I’d love to be able to experience them afresh. Standing in the Comic Shop the other day I was faced with Bat Lash, Phantom Eagle, Jonah Hex, Brave and the Bold and Tor all coming round again. I bought the latest Patsy Walker and House of Mystery comics but didn’t like the art. “The End League”, “Glamourpuss”, “Clandestine” and “Ant” are OK. I thought “The New Atom” was interesting in a retro-1960s way but they’ve discontinued it. Can anyone recommend a few comics that I might enjoy that have “slipped under MY radar” because I’m still buying new comics…but only just. Luckily there are still numerous old comics to buy or re-read. And not forgetting “Alter Ego” and “Back Issue”. 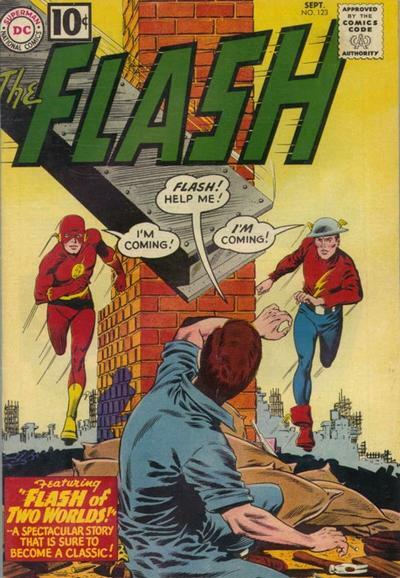 I’ve recently enjoyed re-reading the Archive editions of The (Barry Allen) Flash. I bought them despite already owning most of the original comics. 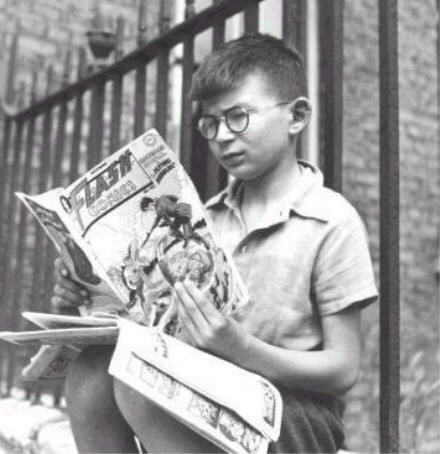 This geeky kid is holding Flash 102 from December 1948.The Flash isn’t even on the cover of his own book.There’s only a couple of issues to go until the title is discontinued. I loved the early 1960s Flash. One of my favourite issues was No123. I puzzled why Jay Garrick’s tin hat stayed firmly on his head without any obvious chin-strap! My copy of this classic issue is coverless because the young me cut the covers off a few favourite comics of the time and pinned them up on my bedroom wall !! When I first started collecting back-issues I wondered why I could never find any issues before No 105 !! 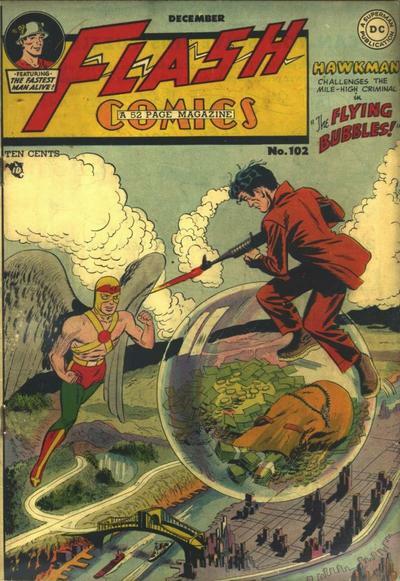 I know there were a few issues of Wonder Woman in the 1940s where she visited “alternate” earths but Flash 123 was the beginning of DC Comics attempt at bringing the concept into their regular continuity with the annual JLA-JSA team-ups. And look where its got us now!! Me standing in a Comic Shop in 2008 looking at a wall of Final Countdown to Crisis 52 and wondering if you have to buy EVERY issue to find out whats going on and lamenting the days of the 80 Page Giant with its (count them) 10 self-contained stories in one issue!! 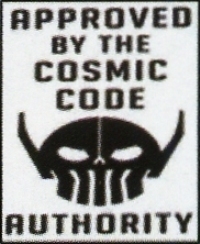 Thorpe and Porter sometimes called themselves “Strato” despite putting a “TP” logo (over the comic code stamp) on the front of their square-bound black and white reprint comics of the early 1960s. Being square-bound and glued many have suffered from the dreaded spine roll. For completeness here is the original ACG comic. The Thorpe and Porter edition has half of the ACG logo on the cover !! The contents are a mixture of ACG material along with DC Science Fiction from My Greatest Adventure, Mystery in Space, House of Mystery/Secrets or similar. 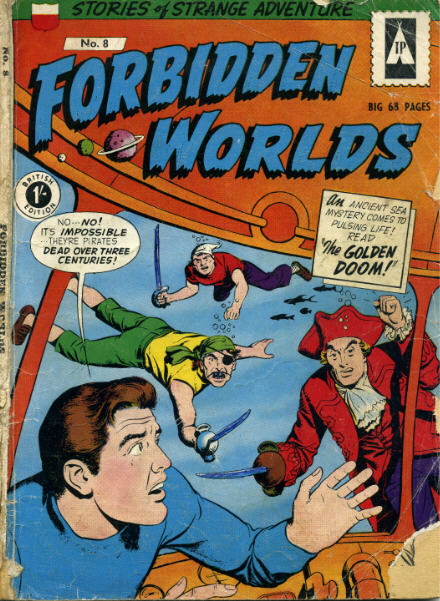 Stupidly the reprint even reprints the letters page from Forbidden Worlds 77 in our Forbidden Worlds 8 even though some of the letters refer to stories featured in ACGs number 73 which wouln’t make much sense to British readers. I think there were only 10 issues of this reprint title. 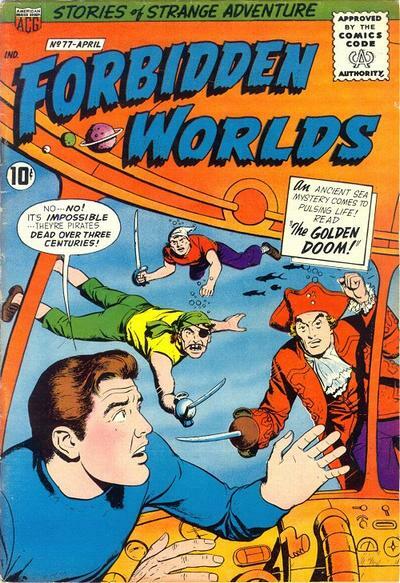 By the early 1960s Thorpe and Porter were importing the original ACG comics (along with DCs etc etc) into the UK. Other reprint titles that were available from “Strato” in the UK at the time included Mystery in Space, Adventures into the Unknown, Out of this World, Justice Traps the Guilty, Blackhawk and one lone Superhero……The Flash. Issue No 1 began appropriately enough reprinting the original Issue 105 along with other DC fare…albeit in black and white.